Many people use a mouthrinse as part of their daily oral hygiene. If you’d also like to include a mouthrinse in your regimen, the kind you choose will depend on what you want it to do for you. If your main desire is fresh breath, then a cosmetic rinse that imparts a minty smell to the mouth should fit the bill. That, however, is all they do — cosmetic mouthrinses don’t contribute to oral health beyond your personal satisfaction that your breath is free of bad odors. But, if you want more — added protection against dental disease, for example — then you’ll need to consider a therapeutic mouthrinse. Therapeutic mouthrinses are usually described as anti-cariogenic (prevents decay) or anti-bacterial, and include both over-the-counter (OTC) and prescription rinses. Their purpose is to either strengthen teeth or reduce the mouth’s bacterial levels. Of the OTC variety, most contain a small amount of sodium fluoride, which can strengthen tooth enamel. They’ve proven highly effective: a number of studies show using a sodium fluoride mouthrinse in conjunction with brushing and flossing reduces the chances of new cavities forming. 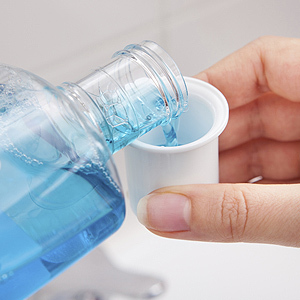 A number of OTC rinses also have an anti-bacterial effect, usually provided by active ingredients such as triclosan, zinc or essential oils like menthol. Even a slight reduction in bacteria can help lessen the chances of gingivitis (gum inflammation), an early form of periodontal (gum) disease. Reducing bacteria levels may also help alleviate bad breath. Some individuals, though, have higher than normal levels of bacteria, or a systemic weakness in fighting certain bacterial strains. If this is your case, you might benefit from a prescribed mouthrinse intended to lower bacterial levels. Most prescription mouthrinses contain chlorhexidine, which has been amply demonstrated as an effective anti-bacterial control of tooth decay and gum disease. Chlorhexidine prevents bacteria from adhering to the teeth and so disrupts plaque buildup, the main cause of dental disease. Its prolonged use will result in the dark staining of teeth in some people, but this can be removed during dental cleanings and teeth polishing. Long-term use is generally not preferred compared to getting the proper attention from regular cleanings and examinations. If you would like more advice on adding a mouthrinse to your daily hygiene regimen, especially to help reduce your risk of dental disease, please feel free to discuss this with us at your next checkup. Regardless of which type of mouthrinse you choose, they should always be used as a complement to daily brushing and flossing, along with regular dental cleanings and checkups.